I've come up with what I believe is a better and faster calibration technique for my Rostock MAX v2. Basically, instead of eyeballing the height error you measure it exactly using the manual movement controls in Repertier-Host. This is made easier by shifting the Z axis down by one, so you'll be calibrating to Z=1 rather than Z=0. You also only have to home once for each round calibrating all three towers. When finished, you'll shift the Z axis back up. Once I figured this all out it took about fifteen minutes to actually calibrate; I expect I could do it in less than ten with some practice. Enter the following scripts into the G-code popup menu in Repetier-Host. ; the X tower end stop error. ; the Y tower end stop error. ; the Z tower end stop error. ; of 2.0. For testing the horizontal radius error. Set the end stop screws to the middles of their range, as shown in the MAX v2 manual. Find the proper Z max length as in the MAX v2 manual. Then, enter this value PLUS ONE into the "Z max length" field of the printer's EEPROM. This will shift everything down one millimeter, so that you'll be calibrating the bed to Z=1 rather than Z=0. Yes, this means Z=0 would whack into the glass, but you won't be going there. Heat up the bed and extruder to a typical temperature. 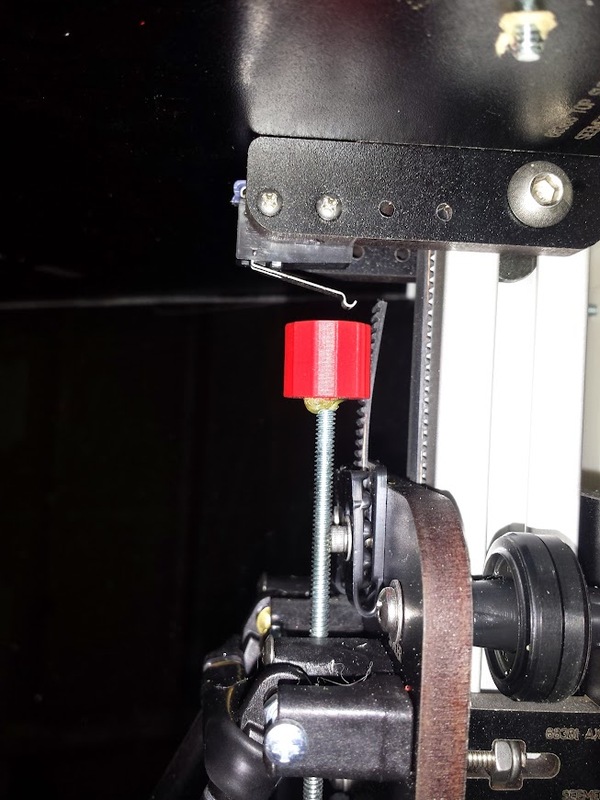 In Repetier-Host's Print Panel, use the Z axis manual control to bump the extruder down by 0.1mm at a time until a piece of paper between it and the glass drags as its pulled. As above, bump the extruder down until it pinches your paper, read the Z position, subtract one, and then write it down as the Y tower error. [*}Repeat again with script 3 and the Z tower, writing down the results as the Z tower error. Run script 4, which moves the extruder away from the bed so you can safely adjust the end stop screws. Then, adjust the three end stop screws. The end stop screws have 32 threads per inch, so, one rotation moves the head 1/32", or 0.79mm. Call it 0.8mm, so that every 0.1mm of error means you turn the corresponding screw 1/8 turn. A negative error mean you need to lower that Cheapskate's home position, so unscrew the end stop screw 1/8 turn per 0.1mm error. A positive error means you need to raise that Cheapskate's home position, so screw in the end stop screw 1/8 turn per 0.1mm error. Go back to step 5 and do it all again. If you're lucky, you'll find everything completely calibrated; if not, go one more round. Once everything is calibrated, go back into the EEPROM and restore the "Z max field" to its proper value (subtracting one). I haven't tried it but should have. I just calibrated this afternoon. The only thing I would observe is that turning screws - at least for me has been 100% inconsistent. I don't know why. I am not going to spend the time establishing some kind of ruleset for screws! Too many other things to think about I guess. fill the knob with gorilla glue, place the bolt in, and place in vice to hold it in place while it cures. now you have a super easy to adjust knob that you can twist with your fingers! At first I had trouble with screw accuracy, but only on the Z tower, right after running script 3. Then I realized that I was pushing the extruder into the glass, which stretched/compressed things. Adding script 4, which moved the extruder away from the glass, made it all work. So, if you're 0.9mm off, turn the screw one full turn, plus half of the distance between the notches. Add a little tape flag to the side of your screwdriver tip and it will be even more obvious. So you've taken a four step process and turned it (apparently) into a 13 step one. I applaud your ingenuity and enthusiasm, but I wouldn't recommend that process to a new user. The process outlined in the assembly guide simply works. It was designed by a guy that's forgotten more about delta geometry printers than I'll ever know and is used by pretty much every single delta design out there. (Kossel, Rostock, Cerberus, etc). Well, there's simplicity, and there's drudgery. It takes about five minutes to set up the scripts. With them set up, I just did a test: I randomized the end stop screws and then recalibrated. With me making a few mistakes, and going through four rounds of measurement, the total recalibration took six minutes to within 0.1mm. Triple that for a new user, and we're still talking a half hour to calibrate. I've never done it the standard way, but I've heard times of around an hour from experienced users. Is that right? How long does it generally take a new user to calibrate the standard way? BTW, I forgot one detail: the calibration positions are chosen so that the nearest delta arm is vertical. That way the effector height error is the same as the end stop screw error, which makes life a lot easier. The positions I gave are right for a Rostock MAX v2; I don't know if they'd be different for a V1, and I'm sure they'd need to be different for other printers (e.g. an Orion). dtgriscom wrote: Well, there's simplicity, and there's drudgery. It takes about five minutes to set up the scripts. With them set up, I just did a test: I randomized the end stop screws and then recalibrated. With me making a few mistakes, and going through four rounds of measurement, the total recalibration took six minutes to within 0.1mm. Triple that for a new user, and we're still talking a half hour to calibrate. Why do you feel they would be different for an Orion? It essentially uses the same firmware, just with different settings because of its size. I'm asking because I have an Orion and I thought the Rostock Max calibration for the .091 Repetier firmware would work also for the Orion. There is not a written calibration routine in the Orion manual yet but the above for the Max V1 is what I assumed would work. dtgriscom, I see you are nearby in Wakefield. I'm in Groton. Z-Calib allows Z < 0. Retest sd read on error preventing abort on error. Eaglezsoar wrote: Why do you feel they would be different for an Orion? It essentially uses the same firmware, just with different settings because of its size. That's it: my scripts move the extruder to the very edge of the Rostock MAX bed, so that the delta arms will be vertical. I assume that on the smaller Orion these moves would be refused, be clipped in some way, or would result in the extruder banging into the towers. I doubt that the calibration scripts in Gene's manual have this problem. Does anyone know of a platform-independent (literally) way to write these scripts so that they'll work on any SeeMeCNC machine (or, even better, any Delta arm machine)? Can Gcode handle variables? mhackney wrote: dtgriscom, I see you are nearby in Wakefield. I'm in Groton. Cool, but looks like this is only available when navigating via the LCD. I'll try it out when I get home tonight; switching back and forth between computer and LCD might make things harder, not easier. FYI, the calibration process HAS been added to the Orion manual and it's vastly different from the Rostock MAX. The gcode included will work with both machines unchanged. Thank you for adding the calibration routine to the Orion Manual. Seems very easy to understand. I change between hotends for different types of jobs at least twice a week and I'm able to recalibrate within 10 minutes. The biggest pain in the arse is of course the first calibration pass where you have to get your delta radius stuff sorted out. Luckily that's a one time procedure. I appreciate the calibration suggestions, however, I think there's a nice simplicity in the mechanical approach and once you get the process figured it it's really quick and simple. If you have to change the calibration when all you do is change a hot end, you've got something really odd going on. When you change out a hot end the only thing you need to change is the Z height. Well, if you use the manual knob control, not in the software, but in the LCD panel, then you can go to negative values. I'd been doing something similar for a while now, using a wider points for testing the bed and homing manually, measuring the differences in all points, then adjusting. As John mentioned, I do not get a precise, consisten distance per turn of the screws. I think this is due that it is mounted over not so hard plastic? Not sure if it is the same in V2. artexmg wrote: I'd been doing something similar for a while now, using a wider points for testing the bed and homing manually, measuring the differences in all points, then adjusting. As John mentioned, I do not get a precise, consisten distance per turn of the screws. I think this is due that it is mounted over not so hard plastic? Not sure if it is the same in V2. The V1 (at least in the manual) shows a very long (2") pan head screw, which I can guess indeed isn't very precise. The V2 robot has a short, fairly robust flat-head screw, which works very well and seems to be pretty repeatable, and precisely adjustable. 0.1mm per 1/8 turn is what I calculated, and what indeed I seem to get. artexmg wrote: The V1 (at least in the manual) shows a very long (2") pan head screw, which I can guess indeed isn't very precise. The V2 robot has a short, fairly robust flat-head screw, which works very well and seems to be pretty repeatable, and precisely adjustable. 0.1mm per 1/8 turn is what I calculated, and what indeed I seem to get. Ahhh ... and that's why I NEED the upgrade kit for V2 ... somebody knows when this kit is going to be for sale? Yes, I know, there is ONLY ONE LUCKY Guy with it so far. Getting back to the adjustment, the other way to go is, instead of modifying the height with the screws, go and make that in the software. I asked some time ago to some of the smart guys in this forum and they confirmed that both methods were equivalent. I guess this is how they do the auto leveling procedures in software ((I hadn't taken a look to the code in the firmware to say it for sure though). Last edited by artexmg on Sun Apr 06, 2014 10:45 pm, edited 1 time in total. Using matter control, and its "auto leveling " feature, my prints are awesome!!! Kevinvandeusen wrote: Using matter control, and its "auto leveling " feature, my prints are awesome!!! Is there a write up some where on the auto level? matter control does not need a probe. It just samples three points around the bed, and adjusts the z axis on the fly. pretty sweet. been using it since I was a t 3d printer world expo in Los angeles several months ago. Joe, the auto level ins at the bottom of the page in the software. also has a cool text creator to make quick printed signs. How does that work? Does the user move the nozzle to touch the bed at each of the points, and then the software does the rest? The software does the moves - keep in mind that this will NOT cure a delta radius problem. If you've got a good delta radius calibration, this auto-level brings nothing to the table. That being said, it's excellent for cartesian machines that don't have a z probe.